What all these brands have in common, is the combination of a worldwide presence, a recognizable image and a large loyal customer base. These brands managed to create a brand experience that emotionally engages the customer. I would like to highlight L’Oréal Cosmetics and their slogan. The slogan was first used 40 years ago and is still very effective today. They did make some tweaks along the way, but the overall theme of “self-respect” has stayed in tact. It all started with “Because I’m worth it”, then evolved to “because you’re worth it” and a few years ago they updated it to “Because we’re worth it”. 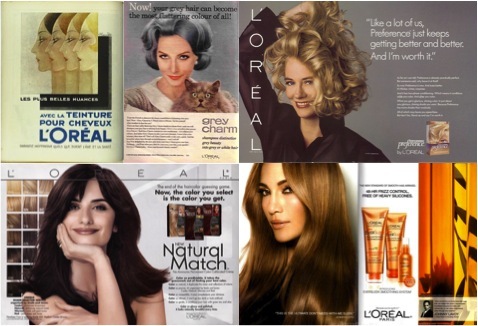 The shift to “we” followed a psychology-based study of l’Oréal’s consumer base. “We” apparently creates stronger consumer involvement in l’Oréal’s philosophy and lifestyle and provides more perceived consumer satisfaction with l’Oréal products. In 1971, when the slogan was first used, it was revolutionary. Jane Fonda, who hosted the 40 Years event, said: “Women weren’t used to feeling like we were worth it. Even though I was successful and famous, I did not feel like I was worth it.” Another face of the brand, Ines de la Fresange, explained that for her, being worth it is as much a feeling as a look: “beauty is the exterior manifestation of what happens on the interior”, she said. “It isn’t just about what we’re wearing on the outside, it’s about how we’re feeling”. So, do you look beautiful today? Or do you feel beautiful? I wish for you the latter , because you are worth it! This entry was posted in & Other Things, Fashion and tagged because we are worth it, Cosmetics marketing, L'oreal, slogan by sofischoice. Bookmark the permalink.